3. Rapid Leveling: Hands free leveling of mount on wall. 4. Multiple mounting option including 16", 20" and 24" on center studs. 5. Integrated security with addition of padlock. 6. All mounting hardware included. 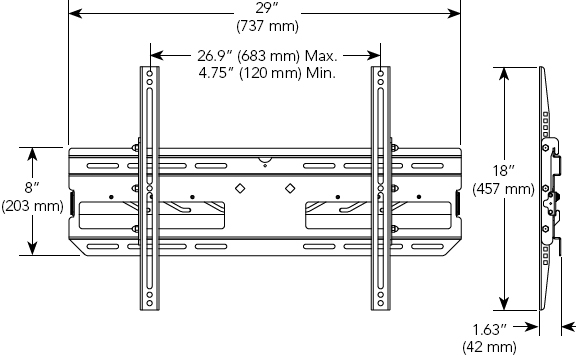 The maximum width between your mounting holes must be less than 26.9” (683 mm) and the maximum height must be less than 17” (432 mm) to ensure compatibility of this mount. 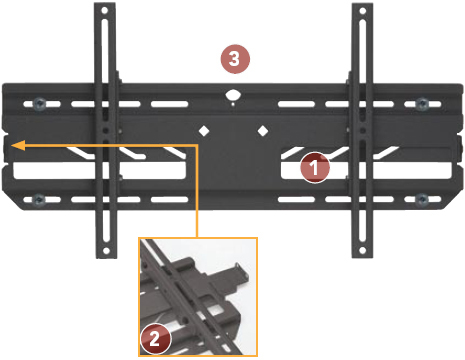 The RLF1 Universal Fixed Mount for large flat panels offers unique installation features in an ultra low-profile design. Determine the PWR model number you need by cross-referencing the manufacturer and model number of your display on the Cross-Reference.